Saddle can be replaced, is quickly mounted, and reliably fixed - without tools! 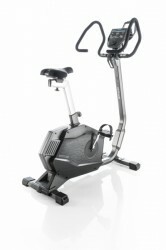 Kettler exercise bike Ergo C12: The luxury model of the Ergo series and Made in Germany! The Kettler exercise bike Ergo C12 presents the perfect combination of minimalist design and innovative technologies. It is made of high-quality and durable materials, which are of a careful workmanship. The Ergo C12 is suitable for ambitious fitness sportsmen, who want to strengthen their health and who mainly want to improve their performance. The Kettler exercise bike Ergo C12 is characterised by a high cadence quality index (TQI). It describes the quality of the concentric run, which is of a great importance for regular and challenging, sporty training. The concentric run of the Ergo C12 is comfortably smooth and joint-gentle. It is guaranteed by high-quality materials and the perfect combination of the components. The concentric run is supported by a balance mass of 10 kg, which is combined with a powerful induction brake system. The Kettler exercise bike Ergo C12 belongs to the C models, which are especially characterised by their extra stiff, enormously stable, and very comfortable frame design. The Kettler designers increased the wall thickness of the tube and developed steel tubes with a hexagonal honeycomb structure - everything for an improved stability and safety of the exercise bike. The improved stability is shown in particular in the joints. Here, the screw connection is tighter due to the big supporting surface. The Kettler exercise bike Ergo C12 is made for intensive training sessions and offers a great comfort. Being equipped with an extra deep step-through, the C12 frame provides a comfortable, safe getting on and off and reduces the risk of injuries. That makes the Kettler exercise bike Ergo C12 also ideal for persons with physical constraints. The Kettler exercise bike Ergo C12 is equipped with an absolute premium console. It has a precious surface, which is made of acryl and convinces by an easy and intuitive use. The central control element is also very user-friendly, which facilitates the setting of the desired programmes. The training computer of the Kettler exercise bike Ergo C12 offers a memory for four users and a guest and is equipped with seven display languages (EN, DE, FR, IT, NL, POL, RUS). Regarding the training variety and the training possibilities, the Ergo C12 comes up with a lot: IPN coaching, HIT training, Challenge coach, heart rate coaching, programme configurator for an unlimited number of individual trainings. Like all exercise bikes of the Kettler Ergo series, the C12 is also equipped with the new features of the two user modes: AUTO mode and MANU mode. In the AUTO mode (speed-independent), the user sets the Watt target value. In order to keep this WATT value constant throughout the training, the brake power is automatically controlled. In the MANU mode (speed dependent), the user chooses a gear (brake level), which remains the same independent of the cadence while pedalling. The high-quality, well structured colour display shows the currently pedalled Watt value. The Kettler Ergo C12 is equipped with a Bluetooth interface for the transmission of your training data to your smartphone, tablet or your laptop. That's how you can use KettMaps and KETTLER World Tours and benefit from other fitness Apps. Share your training results with other persons and keep your training motivation high. The Kettler exercise bike Ergo C12 is equipped with the Kettler Perfect Adjustment System – the innovative Kettler saddle concept, which offers you individual, customised saddle solutions. It simplifies the adjusting of the individual sitting position and replacing the saddle. The (replaceable) saddle upper components are quickly attached, can be reliably fixed - and the best: You do not need any tools! Within a second, the saddle gets mounted and you can start your training. You can choose from three saddle upper components each with different technologies: BASIC FOAM, FLEXIBLE FOAM, 3D GEL. The Ergo C12 is already equipped with the 3D GEL saddle. However, when the exercise bike is used by several persons, it is recommended to have a second saddle at hand - for the perfect sitting comfort for everybody. The Kettler exercise bike Ergo C12 is equipped with a big, comfortable, and ergonomic multi-position handlebar. It offers you multiple grip possibilities and convinces by a high-quality design. In addition, the innovative adjusting lever below the console allows to adjust comfortably the multi-position handlebar. The handlebar lever is easy to open and guarantees you a reliably strong handlebar in your favourite or individual training position. Please pay attention to the fact that you might have to do a software update to use the full Bluetooth functionality. Please find the instructions at the end of the text. Guter Ergometer, der auch für Menschen über knapp 2 m geeignet ist. Stabile und schwere Verarbeitung, dennoch recht leicht aufzubauen. Vielfältige Programm-Auswahl. Für den Hausgebrauch absolut empfehlenswert. Kettler exercise bike Ergo C12 add to comparison list.